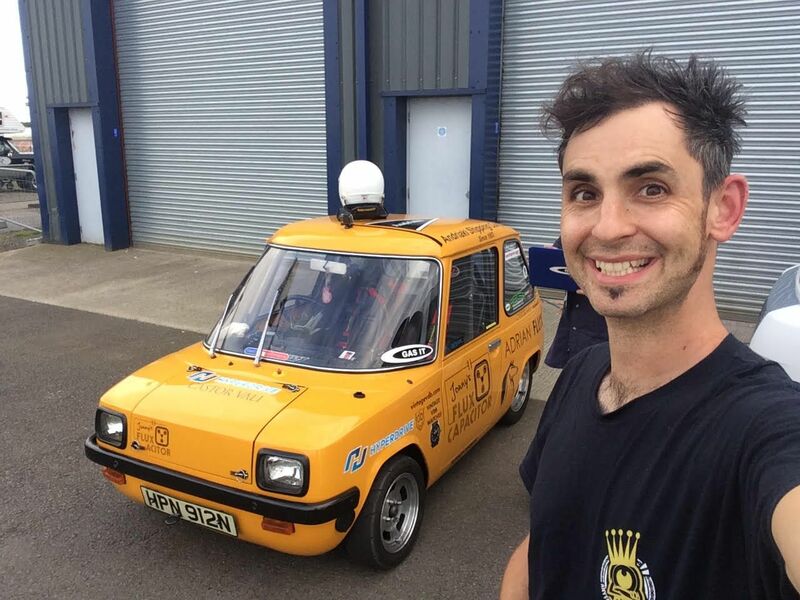 THE WORLD’S QUICKEST STREET LEGAL EV IS…………….2.84 metres long, yellow and often mistaken for a Reliant Kitten. 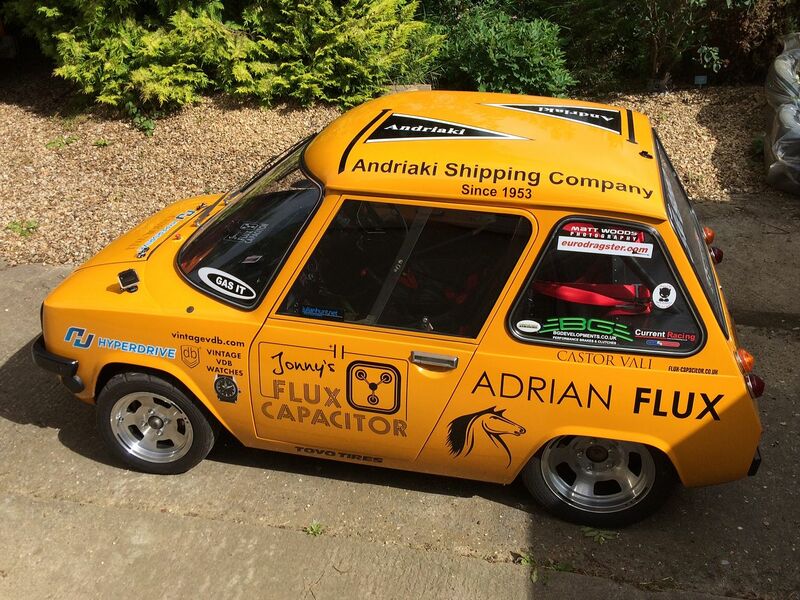 I can barely believe it myself, but the Flux Capacitor Enfield 8000 is the world’s quickest (and possibly fastest) electric car with an MoT and tax. 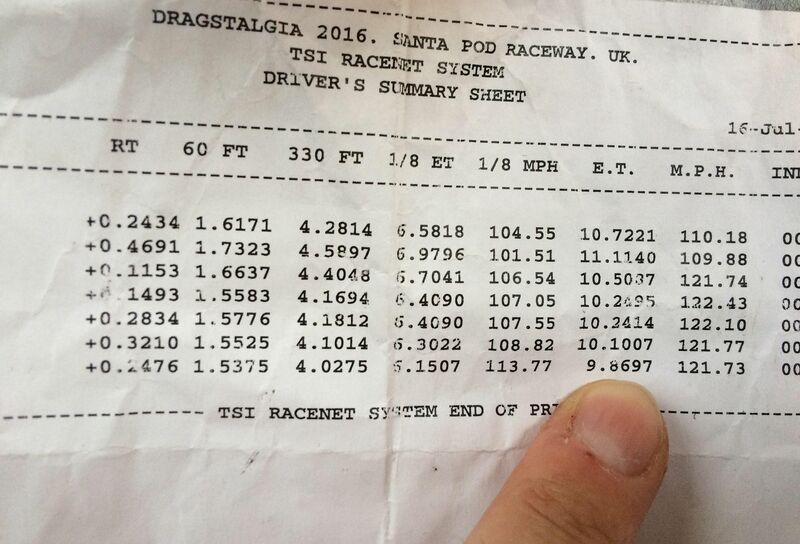 On 15-17 July at Santa Pod raceway’s Dragstalgia event we altered the rear gearing back to the original 3.0:1 and uncorked the 400v 188-cell li-ion battery pack to try to break lower than the (already not shabby) previous PB of 10.51 seconds. The little car had my back all weekend and didn’t let us down, running as straight and true as always – despite a hearty headwind. By complete contrast to the previous race weekend (when we first trialled the boot mounted additional battery pack) myself and crew chief Nick Farrow from GAS_IT never needed to get one tool out of the boot. To achieve a 9 – which is Bugatti Veyron quick and then some – without any hiccups, is something we are extremely proud of. Here below is the pathetic little piece of crumpled paper which we have been working hard – with the invaluable help of Current Racing – for over 3 years to achieve. These are the runs we ran this weekend. 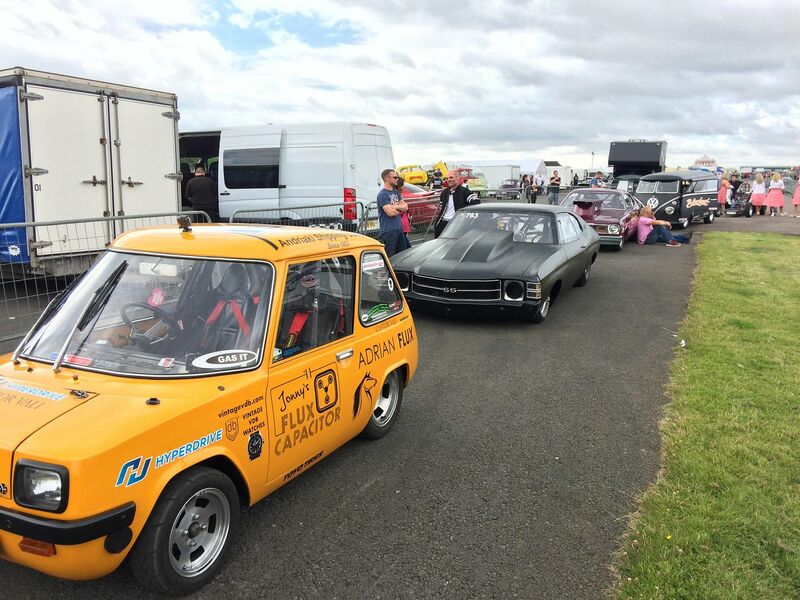 The pair of 10.24s were backed up within 5 mins of one another to clinch a world record quickest EV. Then came the 10.1, followed later that day with the breaking well into the 9 bracket. The lower gear and added power shrunk our crucial 60ft time down, while pushing the RPM limit on the motors made the car sound quite different from the driving seat. Whilst we digest all the onboard footage of the races to edit into something, here are two fantastic vids capturing my 10.1 and 9 second runs by other people. Thanks chaps. The crowd appreciation for the quiet little giant slayer during these four record breaking runs made it all totally worth it. Thanks to everyone who has shown any interest in the build and racing of this true street legal electric drag car. I like to think this can be confidently coined as an EV muscle car. A huge thanks to all my sponsors Adrian Flux, Andriaki Shipping Company, Hyperdrive, Castor Vali, GAS IT and Vintage VDB German handmade watches. The historical connection between the little Enfield car and Andriaki Shipping Co Ltd goes right back to the beginning of Enfield Automotive’s conception. The original owner of Andriaki, John Goulandris, was the man who had the vision of what a zero emission motoring future could look like. He purchased Enfield’s marine engine operation and, moved from aluminium boat engineering into the brave era of electric cars. As a vegan and keen yoga practitioner, Goulandris is widely regarded to have been a guy ahead of his time. 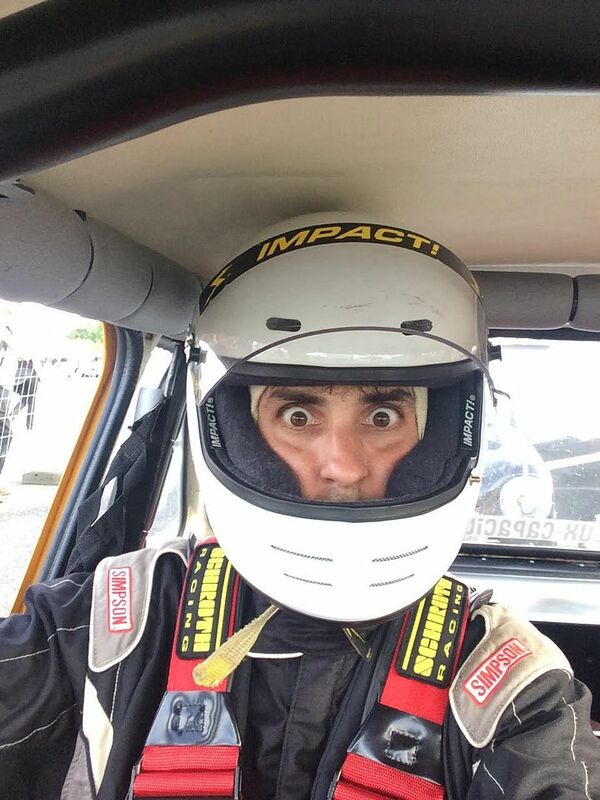 When Andriaki Shipping learned about a tiny piece of their rich history being put through its paces on the drag strip, they wanted to support the Flux Capacitor’s (e)mission statement to become the world’s quickest street legal EV. 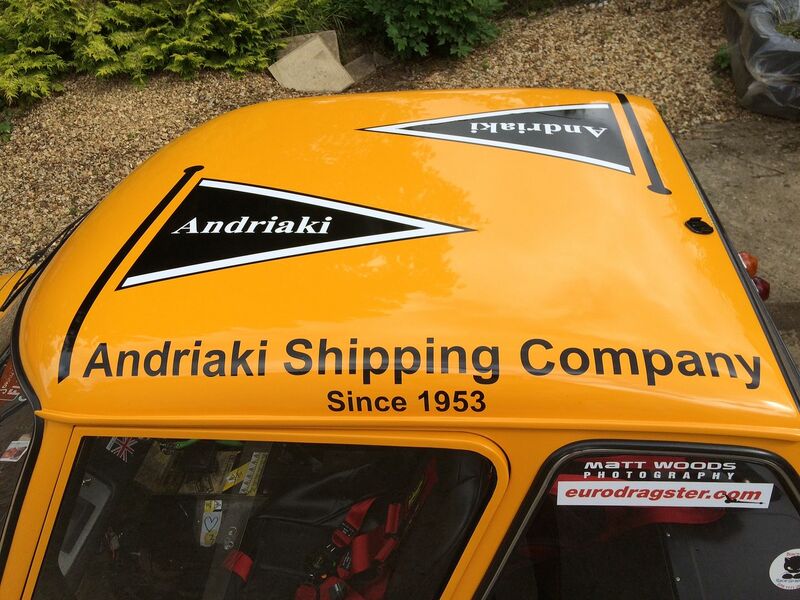 With such a close historical connection, I am incredibly proud to fly the Andriaki flag for British drag racing. Thank you. « As quick as an £800,000 Porsche 918 Spyder. » Autocar eats their words.